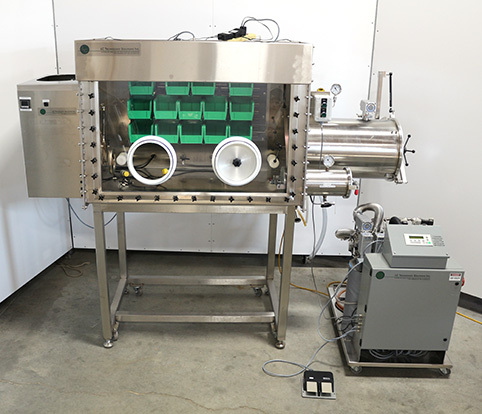 Description: "The LC-100 glovebox system is a complete full size stand alone glovebox. It is capable of achieving and maintaining a less than 1ppm H2O and O2 inert gas environment when connected to our RGP-1 series of gas purification systems. The system is modular and comes complete with everything needed to operate the glovebox. It includes the stand, gloves, lighting, antechamber, quick release window and adjustable bin storage system"
Deescription: "This system recirculates the glovebox environment continuously to produce a less than 1 ppm oxygen and moisture glovebox environment. The system comes complete with a Siemens PLC control unit that is used to control all of the glovebox functions such as the pressure in the glovebox, the regeneration process, purge functions, oxygen and moisture content and many other features."